The results of a citywide mapping project are in, and can be seen online at motorcitymapping.org. The results are in from the citywide mapping project. And there is good news, blight-wise speaking. Out of a total of 6,170 properties recorded, 5,491 are structures. Out of those structures, only 25 are described as being in poor condition. The survey, conducted by the Motor City Mapping Project, found 679 lots, out of which only 21 had debris dumped on them. 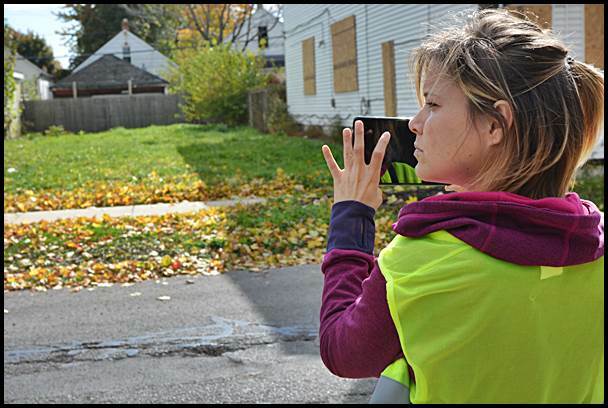 The project, funded by grants from the Knight and Kresge foundations, will allow the city to map out its own blight fighting plan. The city is currently seeking a slice of a $75 million grant to begin that fight. Kathy Angerer, the city’s Director of Community & Economic Development, said the plan comes just at the right time. The results, she said, will be included in the city’s application for a blight grant. Angerer also emphasized that in most cases, the city’s streets have at most one or two blighted properties. By pinpointing those locations, she said, the city can immediately shore up an otherwise good block. “If we remove one blighted house, we remove the possibility of it becoming a drug house and attracting crime,” Angerer said. This is the first comprehensive survey of city properties since the last assessment study was conducted, which occurred sometime in the 1950s. The results of the study can be found online at www.motorcitymapping.org. Mayor Karen Majewski said although she found some errors, the results of the mapping proved Hamtramck is a vibrant city. The project at first was only focused on mapping out Detroit, but then organizers realized that in order to get a complete picture of how bad blight is, both Hamtramck and Highland Park would have to be included since they are both within Detroit’s boundries. The Hamtramck survey took less than a week to complete. Those conducting the survey took photos of all the properties as well as recorded a brief description about appearances and whether houses looked occupied. You can see those comments under the “blexting” portion of the Hamtramck results. Hamtramck has been steadily fighting blight for the past few years. It is a problem that has always been here, and has proven to be a stubborn one. Once a house becomes unoccupied, its condition quickly degenerates. The biggest obstacle in cleaning up blight and knocking down houses that can’t be saved is clearing deeds and titles of ownership. The paper trail is often long and confusing. The housing downturn in 2008 certainly didn’t help matters. That’s when housing values sunk dramatically and many people faced foreclosure or simply walked away from a housing debt that wasn’t worth paying off.